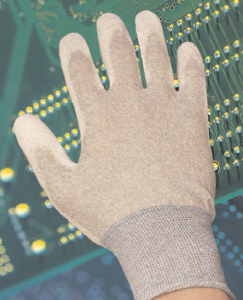 The North Light Task ESD™ is a light comfortable knitted and palm coated glove with low surface resistivity that allows it to safely conduct electrostatic charge. It is ideally suited to applications where sensitive electronic components must be protected from the damaging effects of electrostatic discharge (ESD). The Light Task ESD features a conductive nylon/Thunderon® shell and a PU(Polyurethane) palm coating. The Light Task ESD is a lightweight glove with a comfortable, ergonomic fit that conforms to the shape of the hand and provides minimal resistance to hand movement, thus greatly reducing wearer fatigue.